Cacao production is important! Not only is it the basic ingredient in the world’s favorite confection, chocolate, but it provides a livelihood for over 6.5 million farmers in Africa, South America and Asia and ranks as one of the top ten agriculture commodities in the world. Historically, cocoa production has been plagued by serious losses due to pests and diseases. 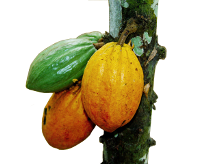 The release of the cacao genome sequence will provide researchers with access to the latest genomic tools, enabling more efficient research and accelerating the breeding process, thereby expediting the release of superior cacao cultivars. The sequenced genotype, Matina 1-6, is representative of the genetic background most commonly found in the cacao producing countries, enabling results to be applied immediately and broadly to current commercial cultivars. Matina 1-6 is highly homozygous which greatly reduces the complexity of the sequence assembly process. While the sequence provided is a preliminary release, it already covers 92% of the genome, with approximately 35,000 genes. We will continue to refine the assembly and annotation, working toward a complete finished sequence. Updates will be made available via this website, to keep informed check back regularly. If you have any questions, feedback or problems, please contact us through the contact link on the navigation bar, we promise to respond in a timely manner. CacaoCyc version 2.0 is available! "The genome sequence of the most widely cultivated cacao type and its use to identify candidate genes regulating pod color"
CacaoCyc version 1.0 is available on CGD! The Cacao Genome Sequence is released 3 years ahead of schedule!